Joey Gatewood and Bo Nix looked great today in A-Day, and Seth Williams is an NFL receiver. 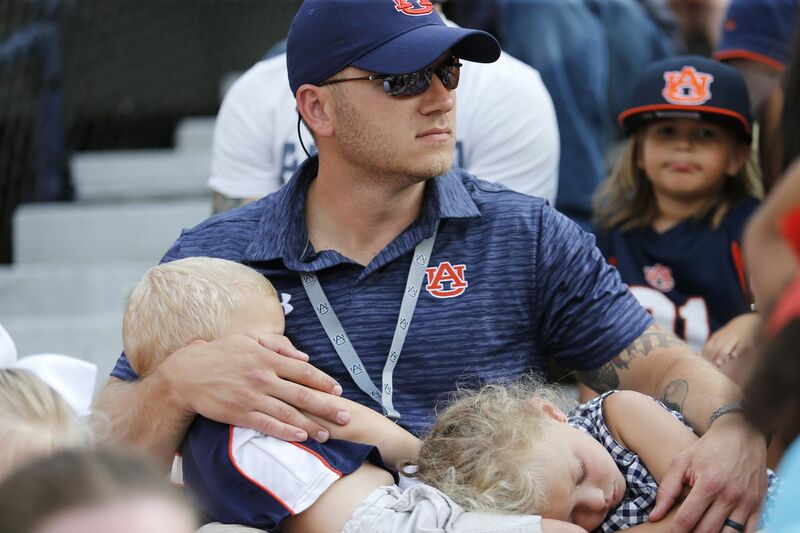 Though most of the time in spring games you don’t see much of anything interesting, today in Jordan-Hare Stadium, fans got to see first hand the battle raging in the Auburn quarterback room. Joey Gatewood and Bo Nix alternated first team reps in the first half, and the two dueled it out all afternoon long. Gatewood opened the game as the first quarterback to see the field, but after an Eli Stove wheel route to get the ball past midfield, the drive stalled. Malik Willis, thought to be a definitive third in the race at this point, started the game with the second team, and went perfect on the second drive. The junior went 5-5 for 64 yards through the air, including a 41 yard toss to Matthew Hill for a touchdown. Bo Nix, the legacy freshman, was able to lead the offense down the field on his first drive with the first team offense. After showing off his mobility a few times, NIx scrambled out to his right from the 11 yard line before he found Eli Stove in the back of the endzone with a dart. Cord Sandberg, minor-league-baseball-player-turned-quarterback, led the team on the last drive of the first quarter. D.J. Williams, the last minute add at RB this past signing day, ran for some tough yards before setting up Anders Carlson for a 46-yard field goal. From there, it the first team units on both sides of the ball showed out for the rest of the day. Joey Gatewood added two touchdown passes in the second quarter to Seth Williams (11 and 29 yards, respectively) and Bo Nix hit Matthew Hill with another touchdown from 49 yards in the last minute of the first half. There wasn’t much action in the second half, with no points scored and most of the starters giving way to the reserves. At one point in the 3rd quarter, Bo NIx threw a bad interception up the middle to Josh Marsh, who then proceeded to fumble the ball away to Harold Joiner. Speaking of Joiner, the hybrid offensive weapon played several roles today. He caught 3 balls for 28 yards with the second team in the first half, and ran for at least three carries in the second half. He also took some snaps at H-back, so it seems like he’ll be a versatile weapon on the field this fall. The star of the ground game today was D.J. Williams. Williams ran 9 times for 57 yards in the first half, and nearly hit 100 yards by the end of the day, He showed a nice blend of agility, power, and speed, and confirmed to everyone in JHS why he was a fast riser late in the recruiting cycle. Despite the play calling being fairly vanilla (it was a spring game after all), Gus made true on his comments that he wanted to push pace. In fact, on Willis’s touchdown drive in the first quarter, the offense ran the 2013 hurry-up-no-huddle offense to perfection, which is largely is why they were able to find some success against a stout Auburn defense. On the defensive side of the ball, the line was able to generate a healthy amount of pressure all afternoon. Derrick Brown ended up with two “sacks”, and TD Moultrie added one as well. This will be key this fall, as there will be a whole new crop of linebackers looking to take over. Pappoe, the 5* freshman, was flying across the field and ended up with a handful of tackles. I’ll be honest, if it sounds like I’m having a tough time providing final stats, it’s because I am. I haven’t been able to find final stats as of writing this, and I was more than a little distracted in the second half, anyways. I found myself sitting with a man named Ed Jones when I returned from the field before the game. If you’re not aware of who Mr. Jones is, you’re probably not alone. But Mr. Jones, 94, will forever be an Auburn legend to me now. We got to talking in the second half, about how he hated the new press box and how “Jeff Beard wouldn’t have let this happen”. As I began to learn more about my company for A-Day, I found out he had been a photographer for the Birmingham News, starting in 1942 all the way until his retirement in the late 80’s. Of course, he had taken a few years off to join the Merchant Marines in the mid-40’s, when he fought in the Pacific theatre. When he returned to civilian life in 1947, he had gone back to work at the Birmingham News, working as a general photographer. But in the 50’s, when the technology became available to send photographs over wire, he quickly offered to cover Auburn football before any of his coworkers could beat him to it. During the next 30-odd years, he saw it all on the Plains: the 1957 championship, the careers of Shug Jordan, the rise of Bryant across the state, the duo of Sullivan and Beasley, and a kid named Vincent Jackson who won a little award in 1985. By the time he retired from the Birmingham News in 1987, he was the king of Auburn photography, as attested to by more than one person in the press box. He continued to photograph for the University in retirement for several more years, though now at 94 years old, he admitted it as bit much for him now. I know this story might not be as interesting to some of you as A-Day coverage, but to be honest, I figured I’d rather hear his story than report on the walk-one taking over in the 4th quarter. Thanks, Mr. Jones, for making my first event with media credentials even more special, even if it as just a glorified scrimmage. The starters won A-Day 28-10, and I’m not sure we’re any closer to knowing who the starting quarterback is going to be. Both first team units looked electric, and it’s hard not to get excited about the future of this team. Oregon and Dallas are still several months away, but I, for one, am excited for this fall.